Shirts With Random Triangles: 1930's Photo Could Be Only The Third Known Photographic Image Of Legendary Blues Musician Robert Johnson. The photo, discovered in a antique desk by a retired lawyer in 2013, allegedly shows Johnson with three known associates sitting at a table. 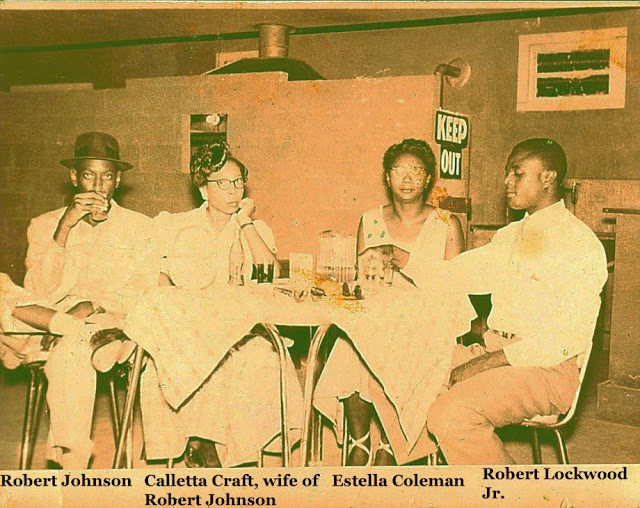 They include Johnson's second wife, Calleta Craft, blues musician Robert Lockwood, Jr., and Lockwood mother, Estella Coleman. Johnson purportedly sits at the far left of the table, drinking out of a glass which obscures his face. Lois Gibson, a forensic artist for the Houston Police Department, analyzed the photo and declared However, another photo that Gibson had analyzed that she claimed was Johnson has not been accepted as authentic by blues historians and forensic anthropologists. There are only two photographs of Johnson, who died in 1938, that are wildly considered to be authentic and documented. They had both been in the possession of Johnson's late sister, Carrie Harris Thompson, were part of a long legal dispute between Johnson's heirs along with the royalties from music performed by Johnson in two recording sessions in 1936 and 1937. 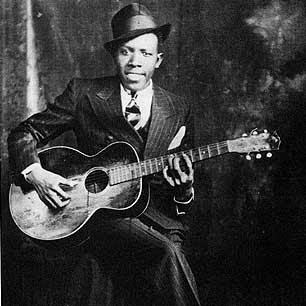 In the decades since Robert Johnson's death in 1938, the forty-two know recordings of his music have had an indisputable impact of blues, rock and roll, and popular music in general. The scarcity of information regarding Johnson's life has fueled the legend surrounding the singer. That includes the myth that Johnson's mastery of the blues and the guitar were the result of a pact with the devil. Johnson's contemporaries dispute the story, and Johnson reportedly cited a more earthly source for his learning how to play the guitar.